An epistemological framework is defined which unifies information and command requirements of autonomous agents as they involve in enterprises and the life spans of artifacts. The framework assumes a division of the manufacturing industry domain into two sub-domains and four activity-layers. The sub-domains are the cybernetic domain and the physical domain. The activity layers cover observations, operations, improvements and innovations. The linguistic primitives records, proxies, versions and modules and the generic services of browser&report generator, model execution engine, version manager and innovation coach are assigned to the respective activity layers. Faithfulness conditions are defined between (successive) situations and events in the physical domain and corresponding constructions and transformations in the cybernetic domain. 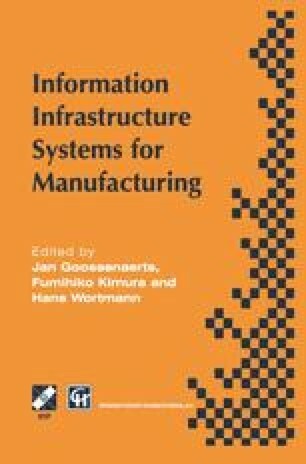 Mechanisms and principles for connecting work and information infrastructure are explained. Information infrastructure CALS framework for enterprise integration artifact life phase service body life cycle modelling. OSD-CALS (1996) OSD-CALS world wide web site - Home page. http://www.acq.osd.mil/cals/.